When it comes to baseball stadiums, Phoenix is best known for Chase Field, the stadium in downtown Phoenix where the Arizona Diamondbacks play during their regular season. But the greater Phoenix area boasts more than Chase Field. Discover all of Phoenix's baseball stadiums from Hohokam Stadium in Mesa to Tempe Diablo Stadium. The 30 teams of Major League Baseball all participate in Spring Training. Half of the teams travel to Florida for the Grapefruit League and the other half to Arizona for the Cactus League. In Arizona, there are 10 Spring Training stadiums where the teams of the Cactus League play. Unlike the stadiums in Florida, Arizona's stadiums are relatively close to one another, so you won't have to travel several hours to catch Cactus League Spring Training no matter where you are staying. You can experience an assortment of stadiums and see a variety of teams during your visit to greater Phoenix. While some teams used to play in Tucson, all the stadiums for Spring Training in Arizona are now located in Maricopa County. The farthest stadiums are about 50 miles apart from one another. The purpose of Spring Training is to let the teams practice in true game-like conditions — a scrimmage if you will. There are umpires and all the traditions of a regular season game. The difference is that this is exhibition ball; the games don't really count, and the rosters are large so coaches can allow some of the hotter prospects from the farm teams to try to win position spots on the official roster when the season starts. 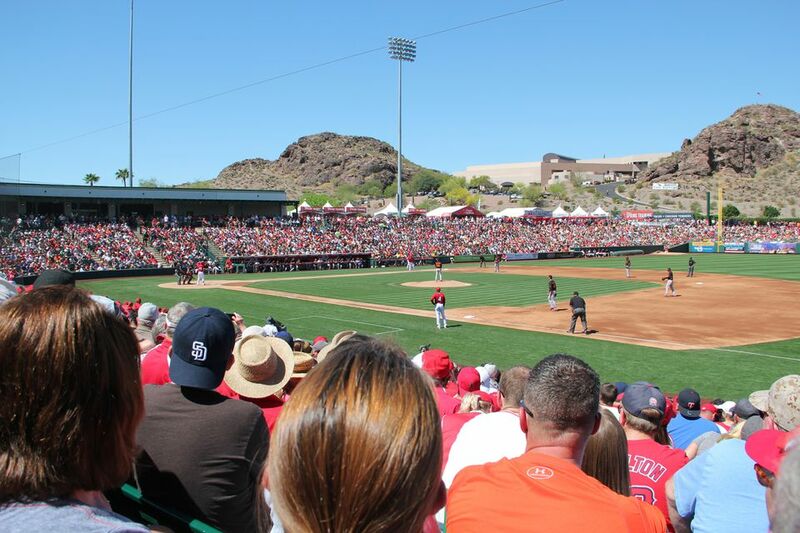 The Cactus League attracts over a million baseball fans each year, many of whom travel from outside Arizona to see their favorites teams play exhibition baseball. The weather is usually great, the hot dogs are tasty, and the prices are reasonable. The stadiums are smaller than the teams' regular stadiums, so all seats are good seats, close to the action. Arizona also boasts yet another baseball season. It's Arizona's Rookie League baseball, and those games take place on summer evenings. Sometimes they use one of the 10 MLB Spring Training stadiums, but sometimes they use practice fields at other locations.